Welcome to the first week of February! I can't believe 2014 is 1/12 over! In math this week we will start off by continuing our work with surface area. After a review on Monday, we will have a quiz on Tuesday. Be sure to be reviewing your classwork and homework to prepare for the quiz. You can also check out THIS online review activity. How to find the volume of cubes and rectangular prisms. 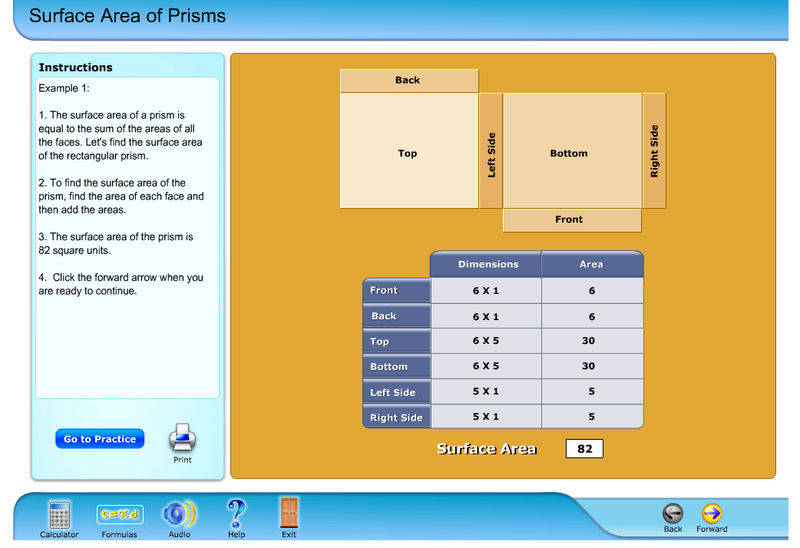 How to find the volume of triangular prisms. You will have plenty of time in class and at home (with homework) to practice this skill. While we will not have a quiz on this concept, I will grade your classwork and homework. Your weekly Compass Learning requirement also focuses on volume. Remember, it is due Friday. We are continuing our work with weather in science. During your work time, focus your studies on weather by completing your "Cloudy with a Chance of Learning" choice sheet. It will be due Friday. Friday is also the day of your weather test. You can prepare by studying your study guide and "Types of Fronts" sheet. Here is a movie showing the lesson I gave to introduce our weather unit...it may also be helpful when preparing for the test. The middle school Valentine's Day Dance is scheduled for Friday, February 7 from 6:30-9:00. This is a semi-formal dance. Admission is $3.50 before the dance and $5.00 at the door. We are also requesting that students bring in one non-perishable item to donate to the Emmaus House. We are looking for parents to chaperone the dance so if you are interested, please let us know. Regarding the student dress code: The dance is a semi-formal dance meaning that girls and boys are expected to dress nicely (as if they were attending an important function). Girls that choose to wear a dress must adhere to the dress code (no strapless dresses or dresses with spaghetti straps). Both boys and girls are asked to tuck their shirts in if they choose to wear pants. Sorry kids! All good things must come to an end. After two days off because of the threat of icy weather and dangerous roads, Savannah-Chatham Public Schools students will return to school Friday at the regular time. I've updated the classroom calendar to included the most up-to-date due dates and test/quiz days. We will go over all of this and make sure you are prepared for anything that comes your way. I'm looking forward to seeing you again tomorrow and hearing how you spent your two days off! Are you looking for a good way to pass some time on your day off school? Check out this game where you become the weather forecaster. The lower levels are pretty easy, but try a higher level for more of a challenge! Stay warm, and enjoy your day off. 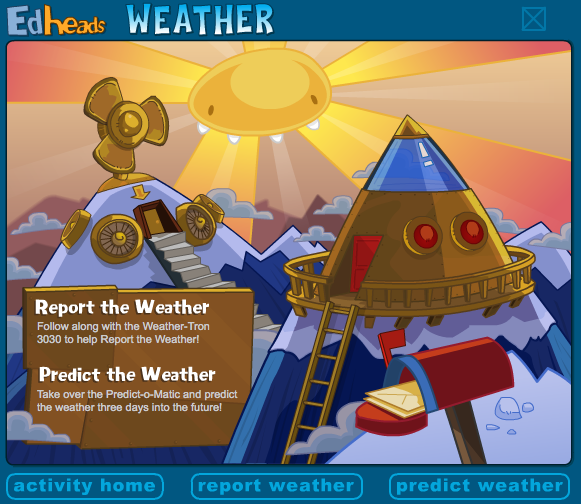 Report and predict the weather with this EdHeads game. Parent/Teacher conferences for 6th grade scheduled for Tuesday and Wednesday will be rescheduled. I will contact you in the near future to find another time that is convenient for your family to attend. Due dates for homework and classwork, as well as upcoming quizzes/tests will be modified upon our return to school. We will talk about this further tomorrow. Weather conditions can change quickly, so please keep a close eye on the news for the latest information. Welcome to the last week of January! There are a lot of fun things in store for you at Ellis this week. In math, we are using what we know about area and composite figures to investigate surface area of 3-dimensional solids. You may want to review your 3-D shapes before we begin. Surface area is defined as the number of square units it takes to completely cover the outside of a three dimensional solid. Surface area problems take a long time to do, and take intense concentration to come up with the correct answer. We will get A LOT of hands on practice this week with calculating surface area. Keep in mind that it will also take some practice on your own time to master this skill. Here's a great tool you can use to help you understand this concept. 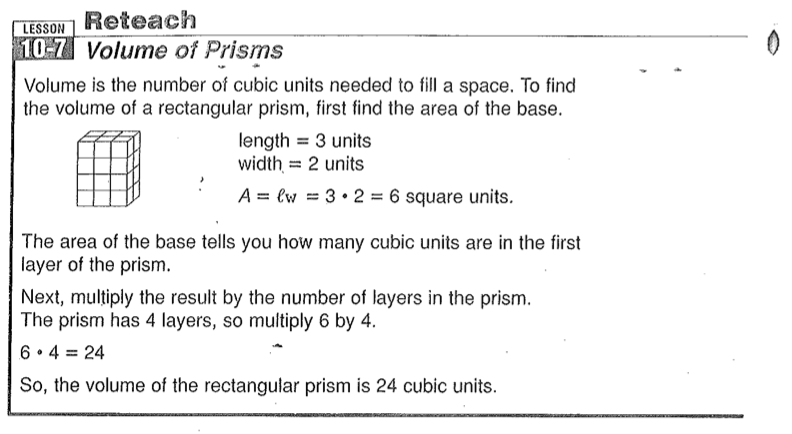 Your Compass Learning assignment (due Friday) will also give you some practice with surface area. I highly suggest that you complete this before your quiz on Thursday. In science, we will continue our studies about weather. Please work hard to complete your "Cloudy With a Chance of Learning" choice sheet by Friday. On Friday you will also have your test on weather. Be sure to review your study guide and the information I gave you on weather fronts. Students created barometers to track high and low air pressure systems. Ms. Carol's homeroom became mentors to teach Ms. Kiersten's class about weather using our classroom responders. Parent/Teacher conferences start this week. I am very much looking forward to meeting with everyone and talking about this year's progress. If you need to change your conference time, please let me know as soon as possible, because we are on a very tight schedule. Our photocopier is STILL not working correctly, so we are unable to print your progress reports as planned. Your grades are always available on the PowerSchool Parent Access program. This Friday is the last Friday of the month, so you know what that means: it is a FREE DRESS DOWN DAY! This week, we are continuing our work with weather. We identified fronts at the location where two air masses meet. Students acted out out the four fronts we are studying using red and blue goggles to represent the cold and warm air masses. Can you identify the front demonstrated in this picture? Students demonstrate an occluded front (where a warm air mass is "occluded" between two cold air masses). Occluded fronts can bring strong winds and heavy precipitation. In addition to talking about fronts, we are looking at the different types of clouds and the weather weather associated with each. 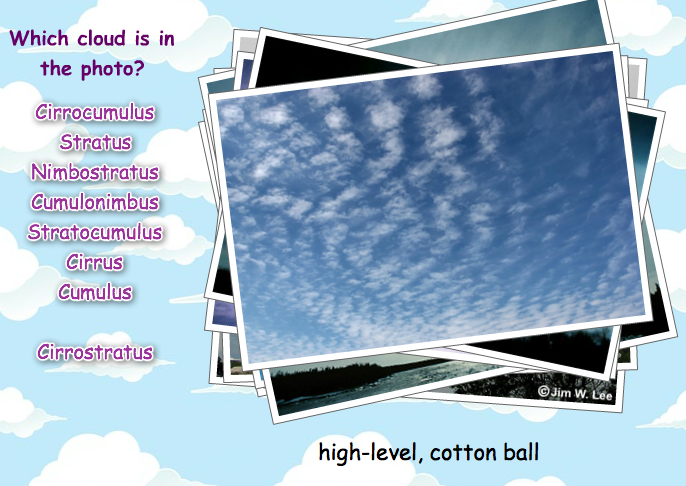 While only being able to identify cirrus, cumulus, cumulonimbus, and stratus clouds is required, I challenge you to identify the many other types of clouds you can find in the sky. Use the following online activity to help you do so. Parent/Teacher conference forms have been sent home today. Please choose the days and times that work best for your family. Our photocopiers are still not working, so progress reports are delayed. Log on to PowerSchool to see your child's current grades. Due to printing issues, progress reports will be handed out Wednesday. Sorry for the inconvenience. UPDATE: Our photocopiers are still broken, so progress reports will not go home until they are fixed. Please remember you can see your child's most up to date grade information by logging onto the PowerSchool program. Happy Martin Luther King Jr. Day weekend! I hope you have an opportunity to enjoy your friends and family during your day off. When you return to school on Tuesday, we will start taking a look at finding the area of composite figures. Composite figures are created by putting together the polygons we've been working with over the past few weeks (squares, rectangles, parallelograms, and triangles). To find the area of composite figures, simply find the area of the polygons that make up the figure and add their areas together. Check out these two resources to help you practice this skill. Please complete your weekly Compass Learning Assignment (due Friday) and your two homework assignments to get you ready for a quiz on Thursday. Keep in mind that since we have Monday off, you have one less day to prepare for your quiz. In science, we will be talking about weather. Here is a study guide you can use to review what we talked about and to help you prepare for your test next Friday. After a lesson on Tuesday, I will allow you to explore on your own using the following choice sheet to guide you. You will have a vocabulary quiz this Friday. Please study the following words to prepare for the quiz. Progress reports will be sent home Tuesday. Please sign and return them by Wednesday. Included with your progress reports will be the 2nd term parent/teacher/student conference request forms. Choose a day and time that works with your family to meet and return the forms to your homeroom teacher by Thursday. Conference will begin the week of the 27th. Are you having a tough time keeping up with all these important dates? Remember our classroom calendar (click the button at the top of this page) has all the important dates you need to know on it! Some students are finding success by copying these items from the online calendar into their planners the Sunday before each week. Perhaps this will work for you, too. Give it a try! Here's a great website you can use to practice what we talked about today when finding area of triangles. 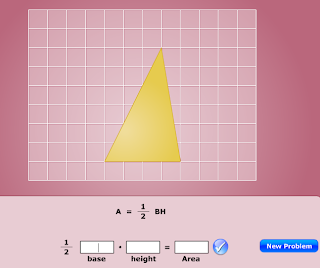 Check out this website for more practice finding area of triangles. This week is shaping up to be a good one in our classroom! In math, we will start our geometry studies by exploring area of rectangles, squares, parallelograms, and triangles. We will have a lot of practice in class using tangram pieces and other manipulatives to practice this skill. Be sure to complete your two homework assignments and your Compass Learning activity so you are ready for a quiz on Thursday. It's also time to take the MAP test again. We will use your score on this administration of the test to show growth from the beginning of the year. Be sure to try your best. Remember, this test is not graded, but we will share your results with you and your family the the upcoming parent/teacher/student conferences. In science, we will continue our studies of the Earth's atmosphere. Use your work time to complete your "Extreme Skydiving" choice sheet and to prepare for Friday's test. Report cards will be sent home Tuesday. Please let me know if you have any questions. This Friday is another dress down day! It costs a dollar to do so, and all the proceeds will go to Ellis Athletics. Today was a fun-filled day at school! First, Mr. Joshua visited to talk to us about gases in our atmosphere. He shared with us some really cool liquid nitrogen and took some time to show off its unique properties. Mr. Joshua shows the interesting properties of liquid nitrogen. We rounded out our day by spending some time with our downstairs buddies from Ms. Kiersten's room. They prepared some fruit salad for us, and we spoke to them about nutrition. We made it back inside just in time for an afternoon rain shower! We enjoyed making fruit salad with our downstairs buddies. Today students sorted the characteristics of the layers of the atmoshere we are studing in class. Each layer has a specific name, temperature / pressure chacteristic, and other specific facts that make it unique. These sorts are a great way to better understand each layer. Remember that there are no morning math tutorial this week. Tutorials will begin again next Tuesday (Jan. 14). Happy New Year! The Earth has completed one more revolution around the Sun just as it has for more than 4 1/2 billion years. Here's to another fun-filled trip around our closest star! This week marks the start of the third term of the school year. Ms. Carol and myself have finished collecting grades for the 2nd term and they will be made available for you to see on your report card. We will discuss them in more detail at the upcoming parent/teacher conferences. Be on the lookout for a sign-up sheet requesting conference times to come home in the near future. This week in math we will take a look at plotting ordered pairs on a coordinate plane. It's a pretty basic concept that can be a lot of fun once you get the hang of it. You will have homework Tuesday and Wednesday night, and a quiz on Thursday. The website www.mathsnacks.com has a great game about coordinate planes called Game Over Gopher. Not only will it give you some extra practice with this skill, but it is also a lot of fun to play! In science we will start our unit on weather. Our studies will begin with a look at the Earth's atmosphere. You will need to know the following vocabulary words for a quiz on Friday. I'll provide you with a paper copy of the information to help you prepare for you final test on the atmosphere that will take place next Friday. In addition, the following choice sheet will also be due. Use the choice sheet at as a way to help focus your studies on that atmosphere. Finally, when you come in Tuesday morning a brand new planner will be waiting for you! We will use this planner to write our homework, classwork, due dates, upcoming tests, and other important items to remember. The planner will take the place of your work plan. If used correctly, these planners can really help you organize your life. UPDATE: Don't forget (like I almost did) that this Friday is a dress down day to benefit our peer mediation program.